Amazon.com description: Product Description: For over fifty years, New York Times bestseller Mastering the Art of French Cooking has been the definitive book on the subject for American readers. Featuring 524 delicious recipes, in its pages home cooks will find something for everyone, from seasoned experts to beginners who love good food and long to reproduce the savory delights of French cuisine, from historic Gallic masterpieces to the seemingly artless perfection of a dish of spring-green peas. Here Julia Child, Simone Beck, and Louisette Bertholle break down the classic foods of France into a logical sequence of themes and variations rather than presenting an endless and diffuse catalogue of dishes. 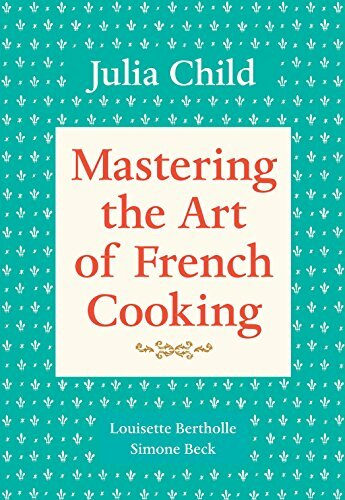 Throughout, the focus is on key recipes that form the backbone of French cookery and lend themselves to an infinite number of elaborationsâbound to increase anyoneâs culinary repertoire. With over 100 instructive illustrations to guide readers every step of the way, Mastering the Art of French Cooking deserves a place of honor in every kitchen in America.